Don't confuse this CNC precision machined lightweight with lower quality plastic slip-on charging handles or charging handles that are made with a bolt added to the side etc. This CNC precision machined Fluted XL Charging Handle assembly is machined to exacting tolerances for a perfect drop in replacement fit in place of the standard factory cast steel charging handle. Fluted XL Charging Handle assembly provides a non-slip grip and easy access even in cold weather with gloves on. Fluted XL Charging Handle assembly is skelatonized for maximum strength with minimum weight and is a high quality addition to any 10/22 or compatible firearm. The Fluted XL Charging Handle assembly comes complete with a precision CNC machined Stainless Steel guide rod and a target recoil spring that is crimped on the guide rod: The crimped rod assembly cannot be disassembled. 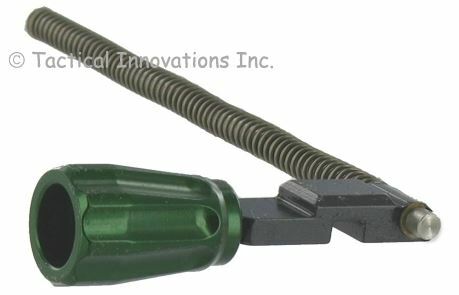 The Fluted XL Charging Handle is quick and easy to install with no gunsmithing required.